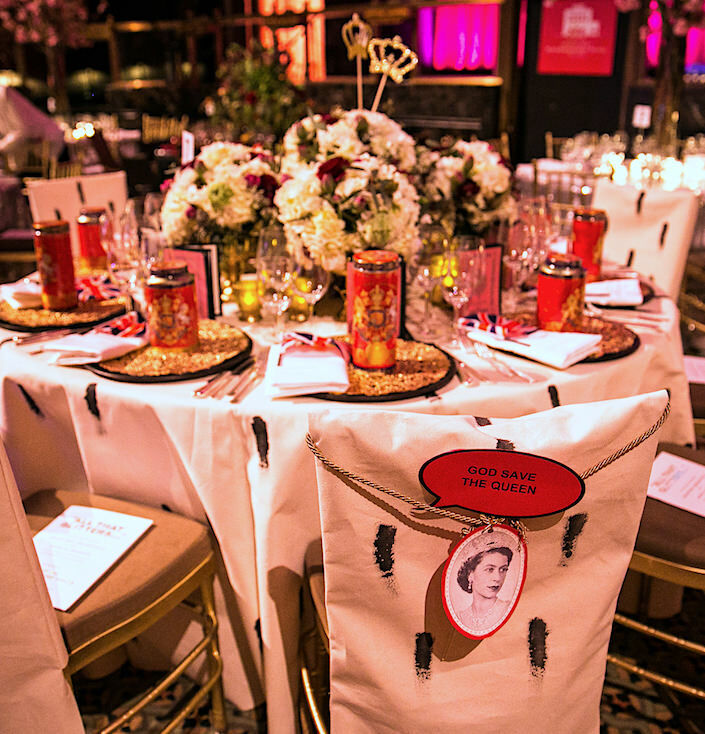 coordinating beautifully with Parish Hadley for Lee Jofa‘s Mingo on the chairs. 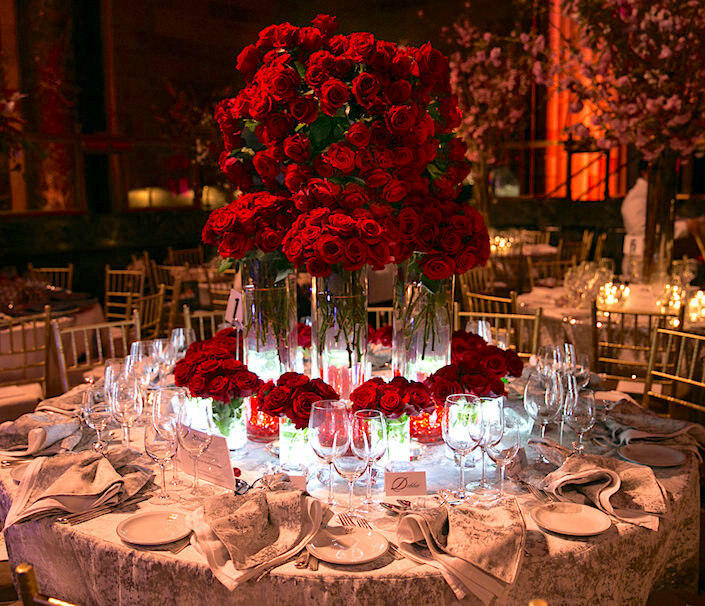 Sebastian Li created the enchanting centerpiece tree. Bunny Williams’ versatile Campbell dinnerware for Ballard sat on charming wooden chargers. 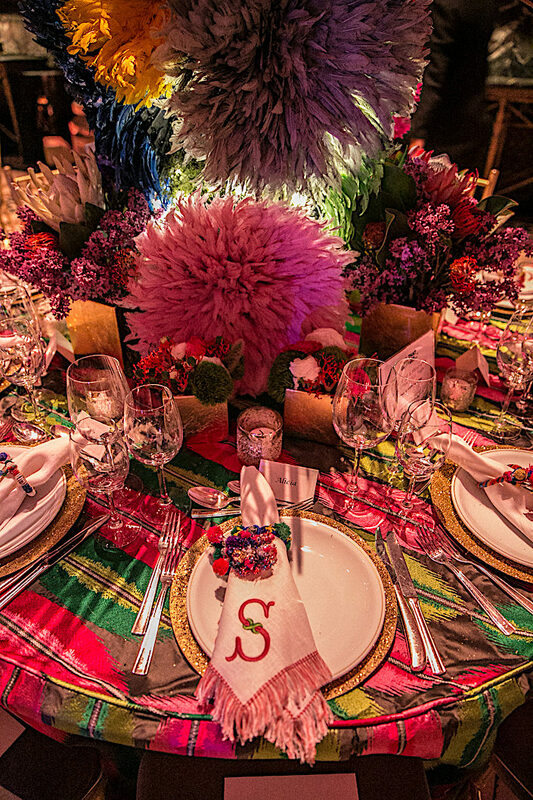 Inspired by beautiful blooms, Sam Allen‘s table was the essence of spring. 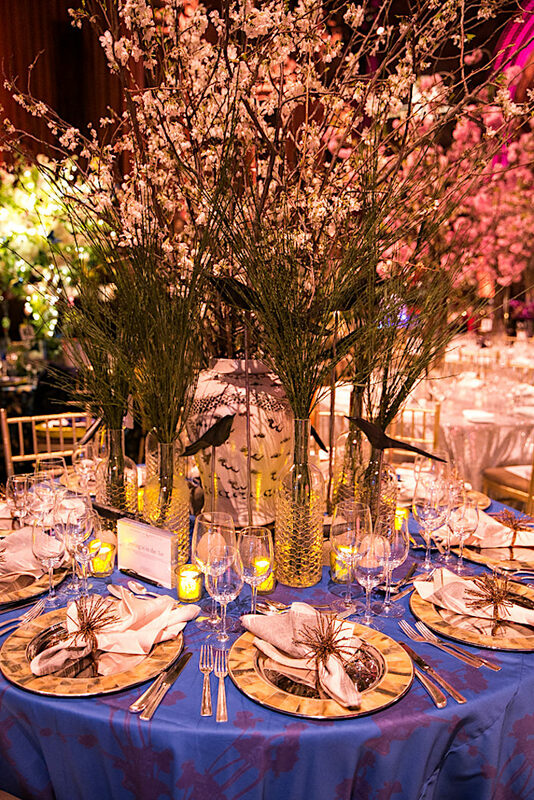 Christopher Spitzmiller‘s platinum luster ginger jar held a centerpiece of beautiful faux quince branches from Diane James Home with fragrant hyacinths in his faux bois cachepots. 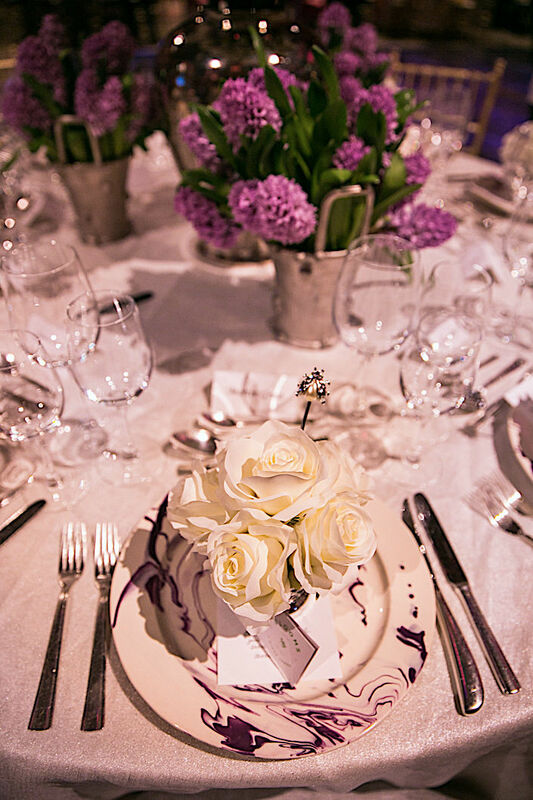 Schumacher’s Shimmer Sheer on the table added subtle sheen and Diane James BLOOMS white roses served as the gift on Christopher Spitzmiller marbleized plates. 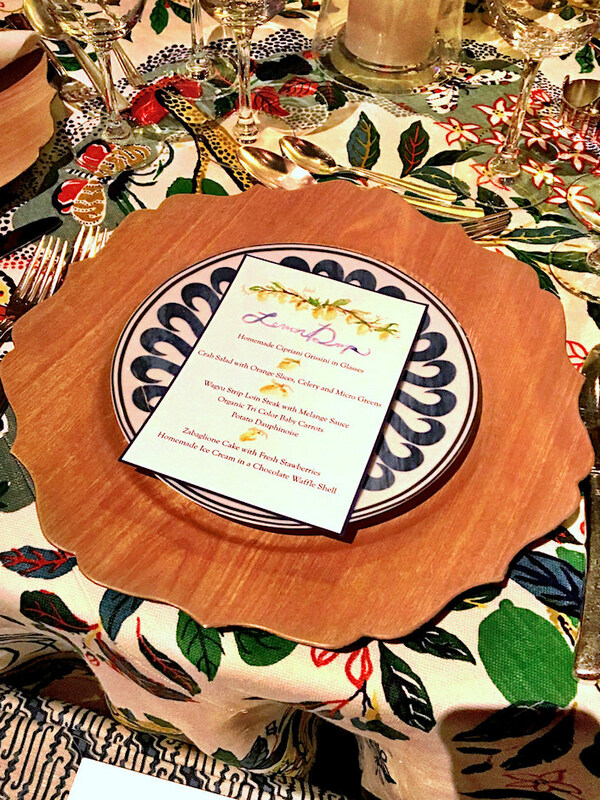 Amanda Lindroth took us the Bahamas with her Island Hopping table. 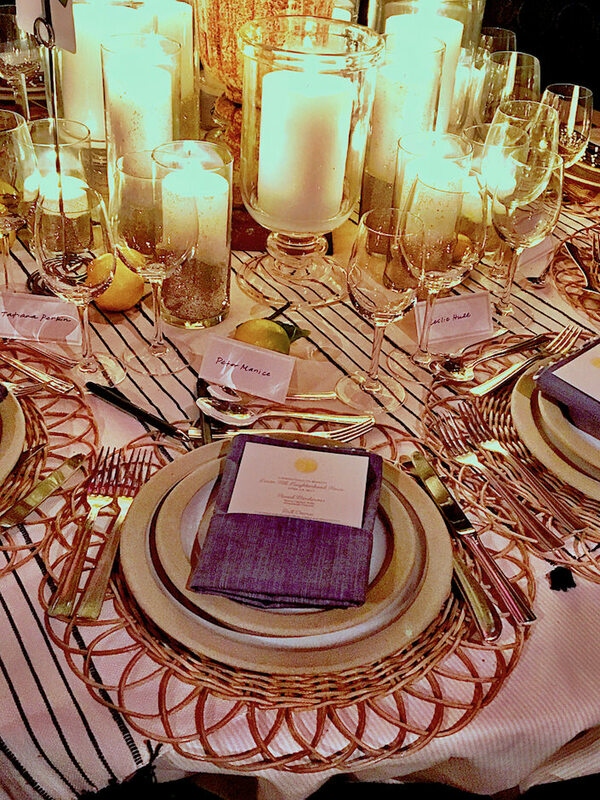 Featuring her signature coral and white striped tablecloth and covetable raffia chargers, you can easily imagine an al fresco dinner at Hope Hill, her beautiful home in Lyford Cay. 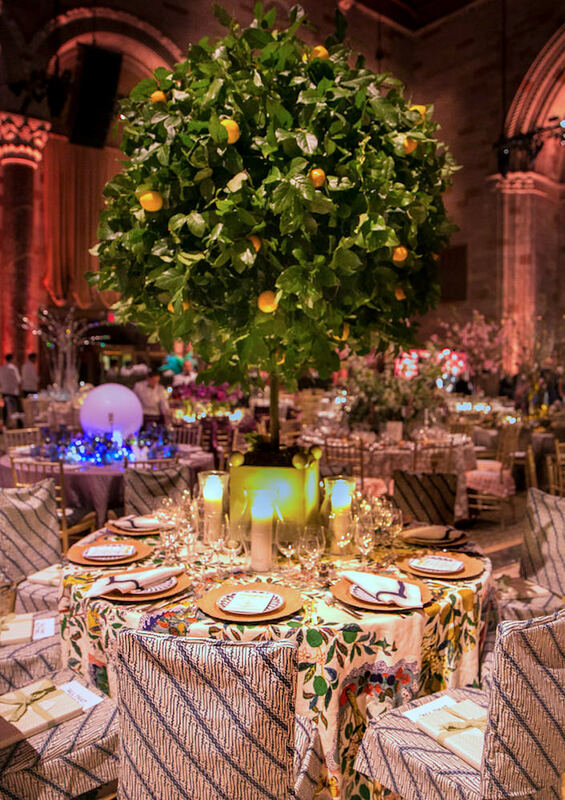 Michael Bargo created a table of Forbidden Fruit for Janus et Cie and Architectural Digest, the event’s media sponsor. 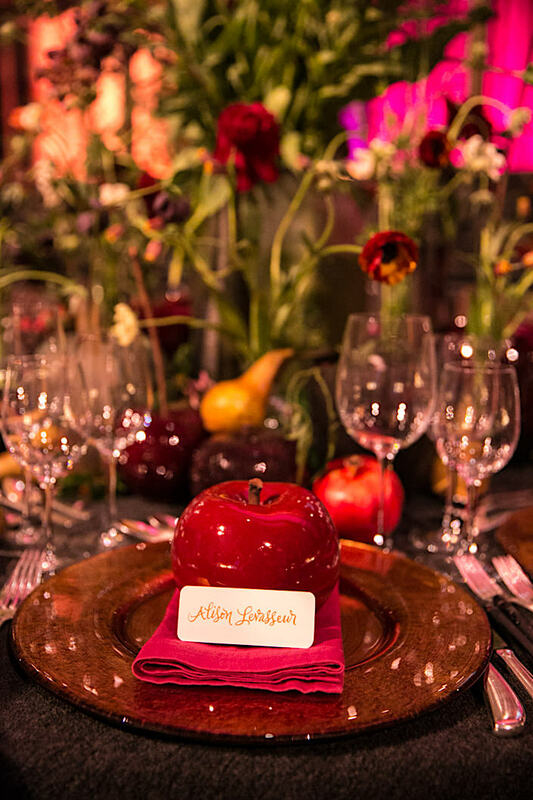 Eve cracked glass and glazed apples served as reminders of the temptation in the lush Garden of Eden. Grace Rosenstein‘s Getting Fresh table for Serena & Lily started with the brand’s Lemons wallpaper, with which she wrapped her gifts (on the chairs and not visible here). 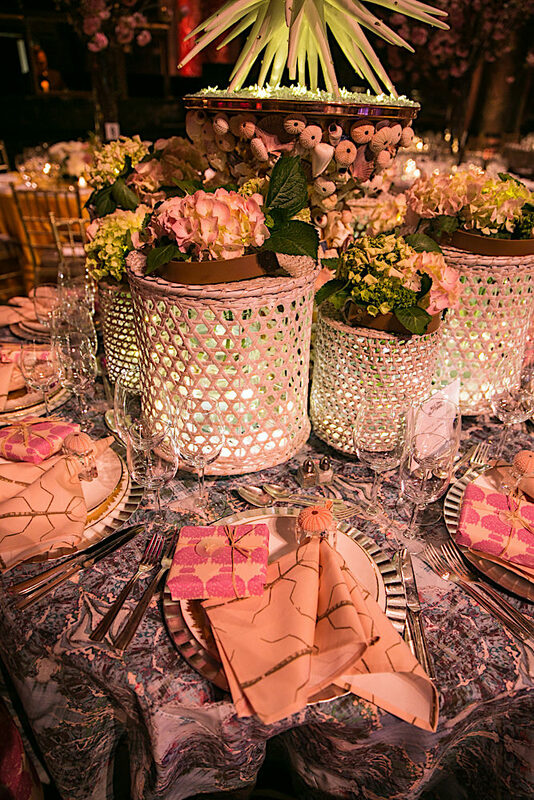 With Serena & Lily tabletop offerings, it was a great inspiration for spring and summer entertaining. 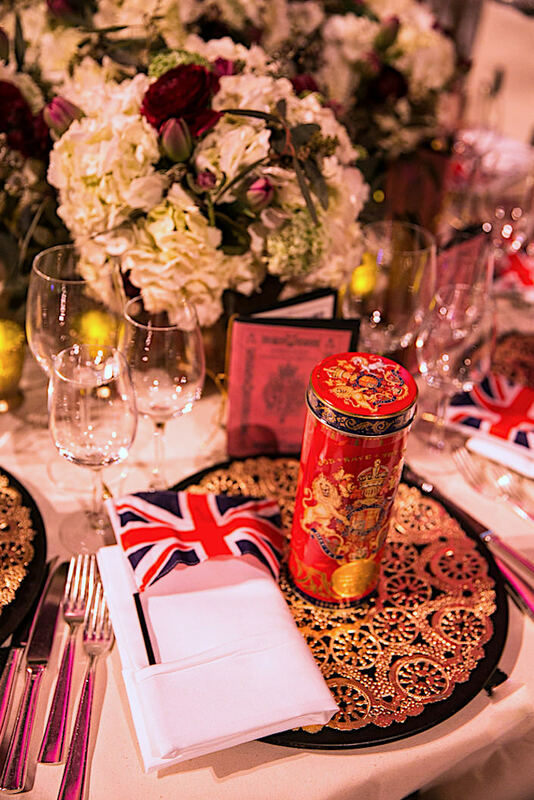 Selina van de Geest referenced her British heritage with her table, The Crown, celebrating the Coronation of Queen Elizabeth II in 1953. 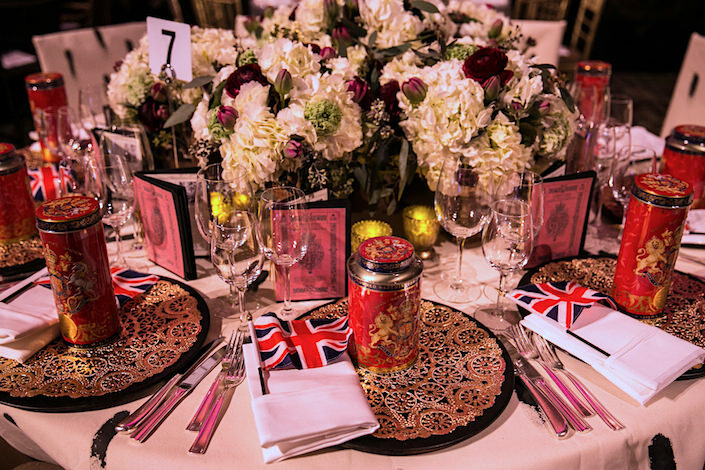 I always admire her clever and layered tabletops at these events. With the buzz around the Netflix series and the Queen’s recent birthday, it seemed particular appropriate. Influenced by the understated glamour of the Royal Family, van der Geest added gold rope on the chairs from Samuel & Sons and offered guest gifts of Coronation Tea and Biscuits from Buckingham Palace. 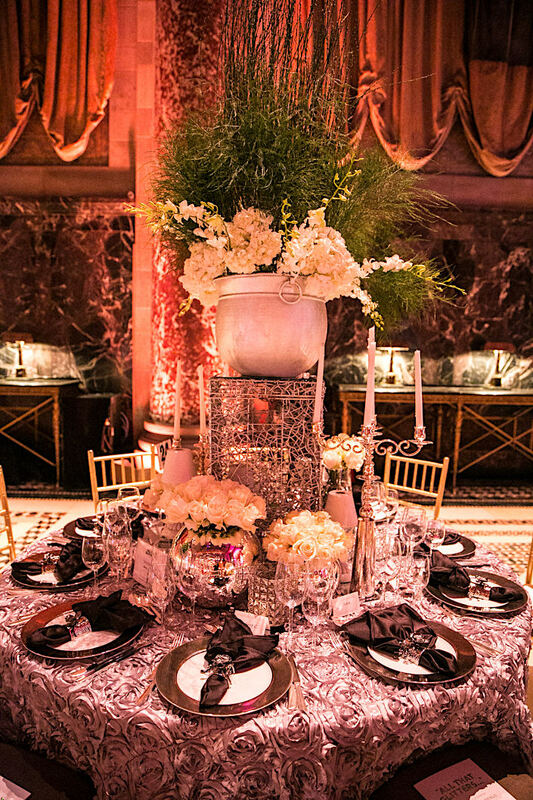 Plaza Flowers‘ All That table was indeed just that! 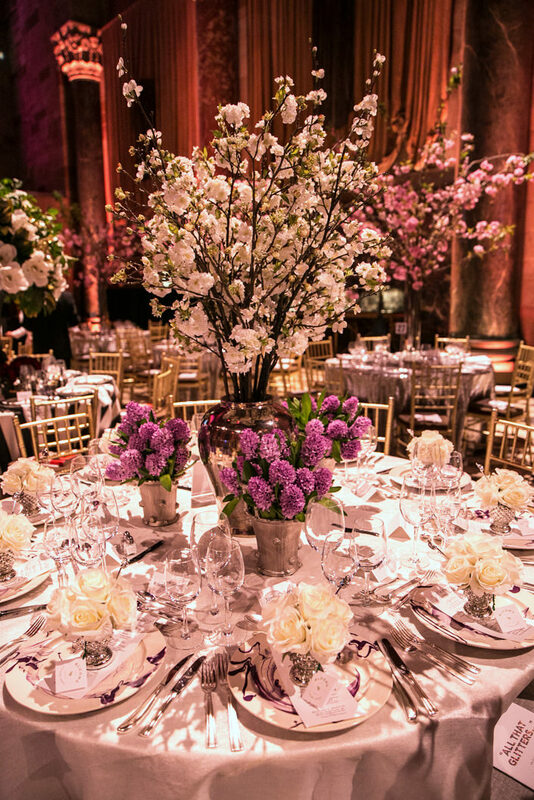 Bursting with an extravagance of purple and lavender blooms and branches, it was a luxurious and lush display of amethyst. 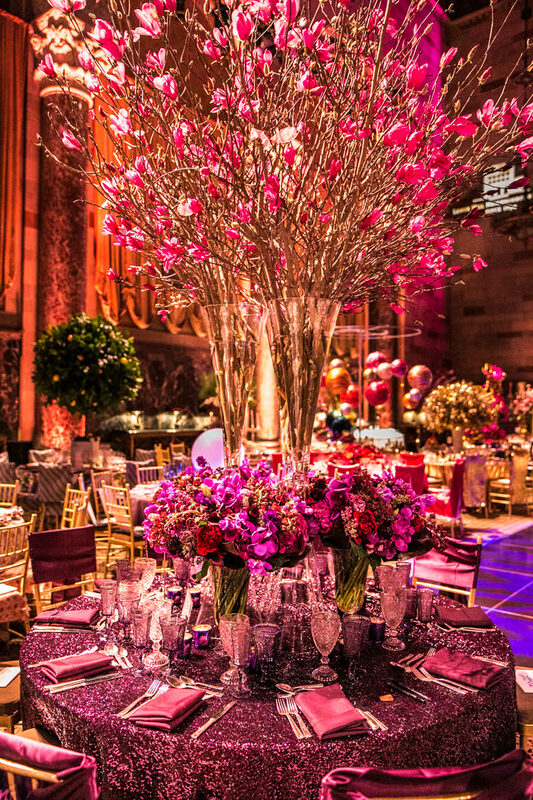 Marc Eliot for swoop, the exclusive event design affiliate of Cipriani, channeled purples and fuschia for his Midnight Magic table. 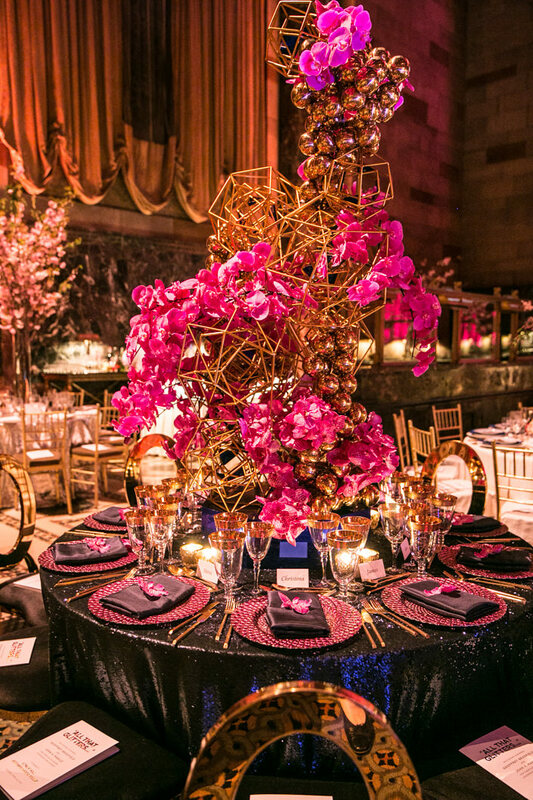 Anchored by a dramatic architectonic orchid filled centerpiece, the table glistened with deep jewel tons and texture. 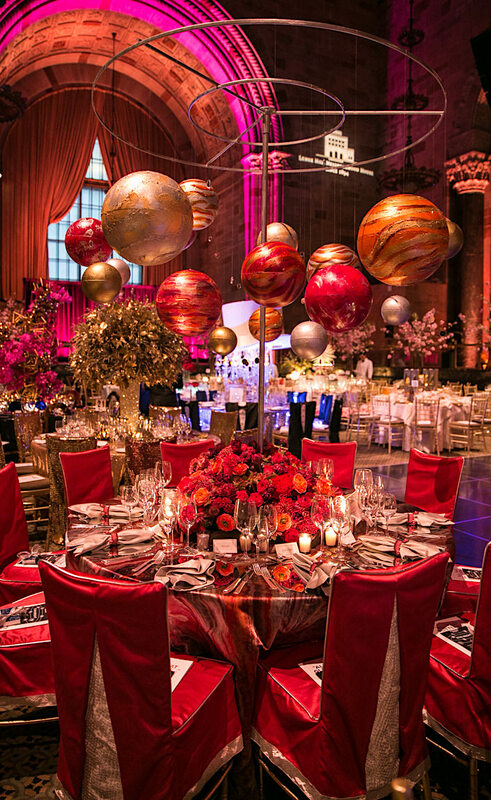 In keeping with the evening’s theme, McMillen Inc.‘s creativity shone with their Star Bright table, proving all that glitters in the universe is gold, including seven newly discovered planets. 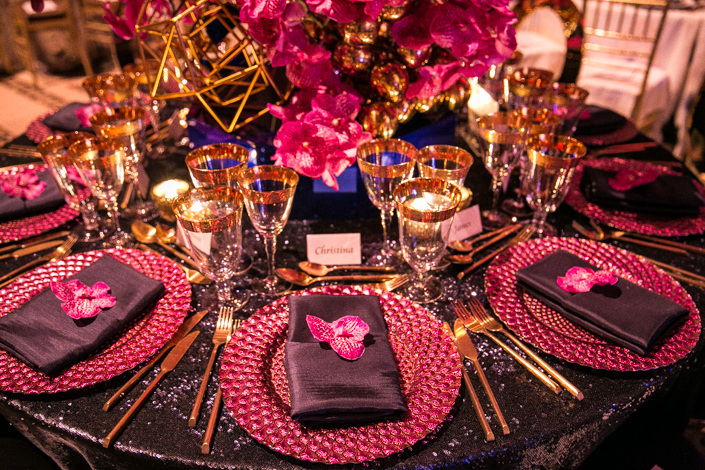 As they explained, “Just forty light years away in an ancient galaxy, these planets orbit a glistening pink star.” Rich red and gold fabrics from Osborne & Little and Romo with Samuel & Sons trim made us excited for a galaxy far far away. Inspired by his old neighborhood of Brooklyn, Michael Wainwright’s Crossing Brooklyn Bridge was an homage to the beautiful structure that is a dominant feature of downtown views. 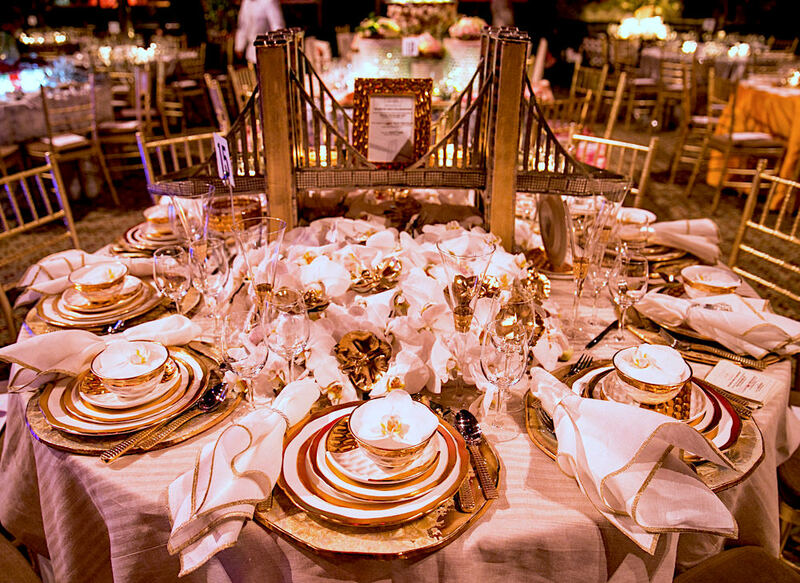 Michael actually handcrafted the bridge himself of porcelain finished with 24k gold and platinum, stretched over a crystal glazed East River. 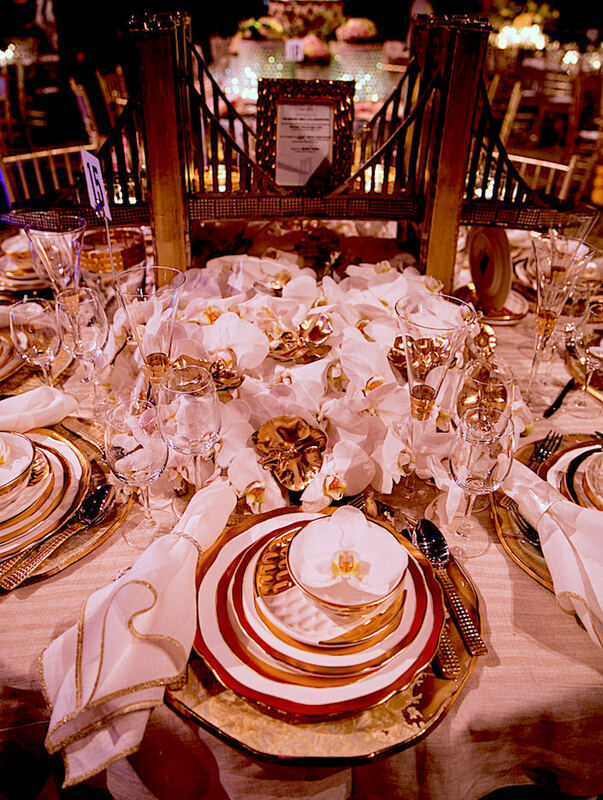 All the elegant tableware if from his collection. 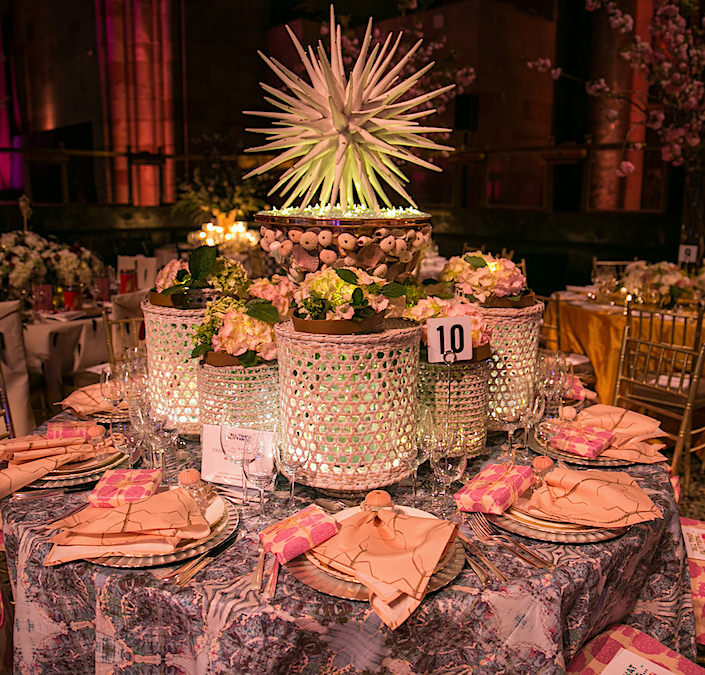 As Thom Filicia‘s table title explained, Spring is in the Air. 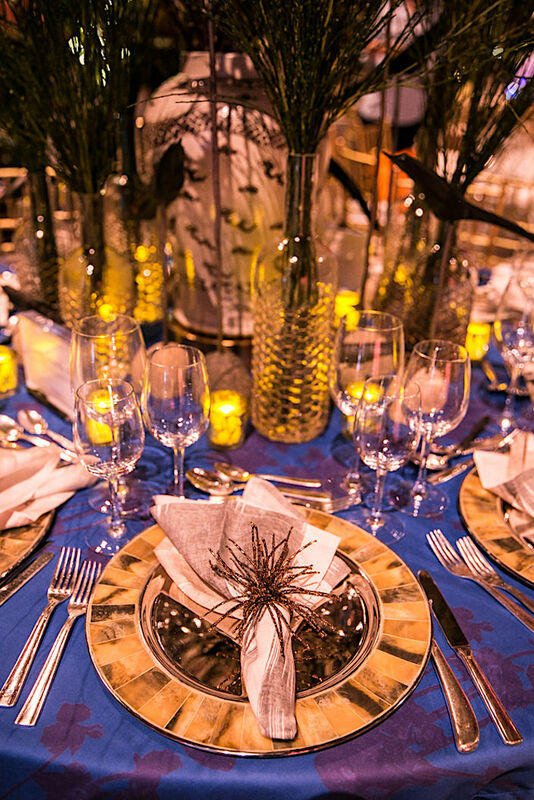 With Ashley Woodson Bailey‘s Frida Blue fabric, he set a table with accessories courtesy of Sedgwick & Brattle with napkin rings and chargers from Jung Lee NY. 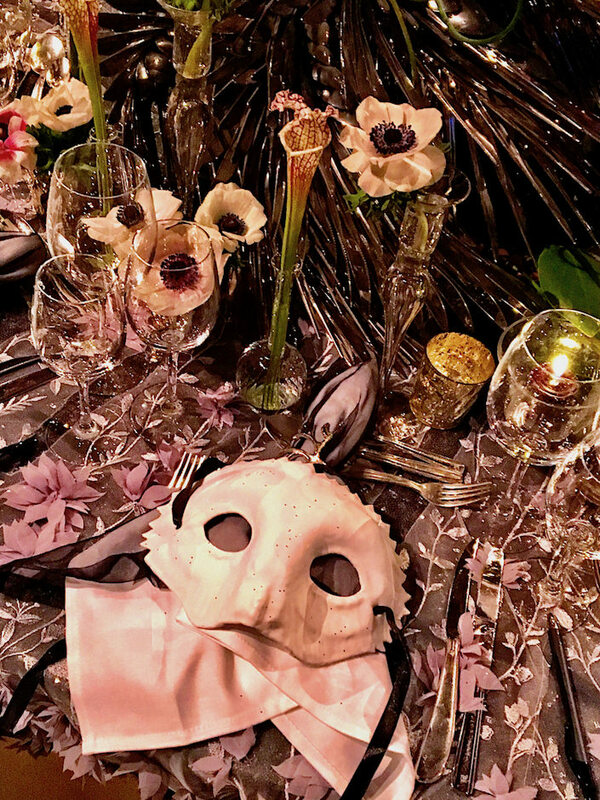 Louis Navarette designed a Dream Garden where, as evening falls, adventure and mystery awaits in a wooded scene. 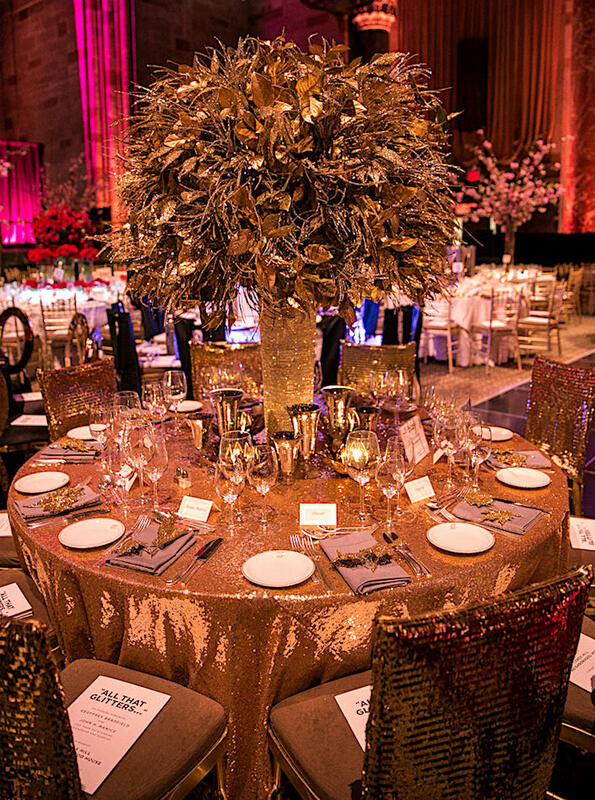 Montana Timchula Interiors‘ table proclaimed Not all That Glitters is Gold. 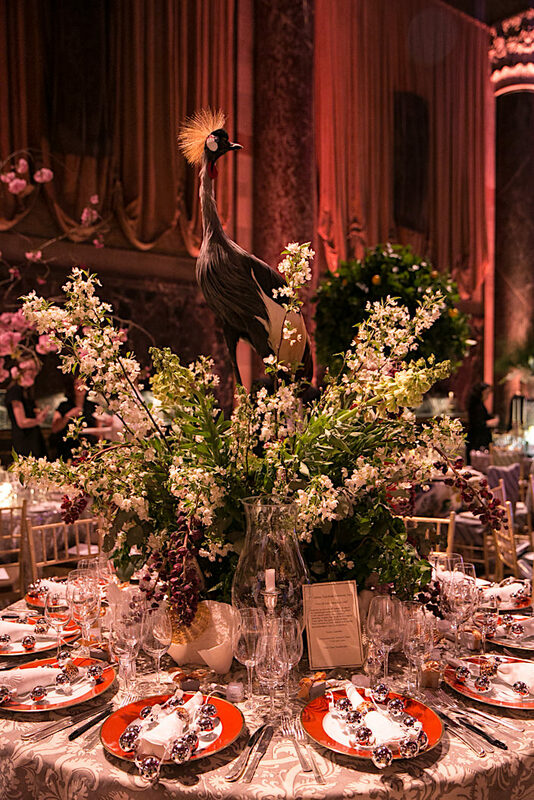 Inspired by the intrinsic beauty of the natural world, the tablescape celebrated nature with silver dipped seashells, a giant clam shell and a Crowned Crane, all from Creel and Gow with china from Mottahedeh and tablecloth fabric from Quadrille. 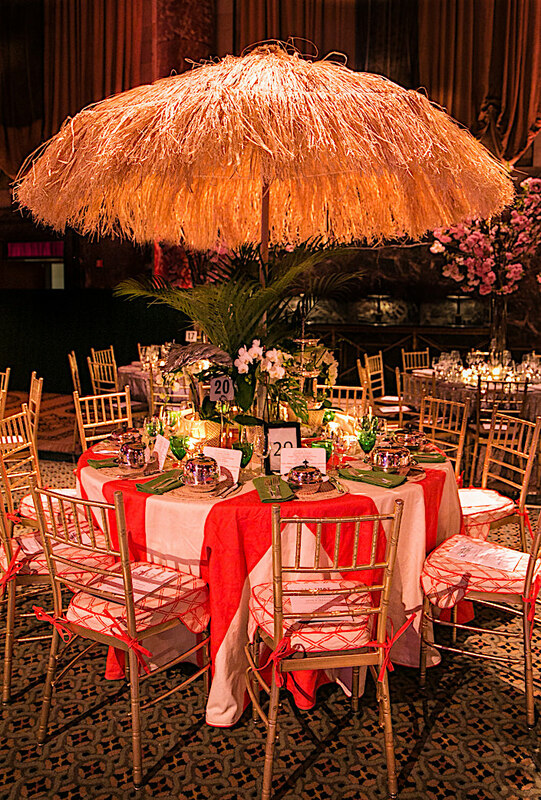 Tamara Stephenson and Susan Young of Root Cellar Designs created a table of Tropical Treasures. 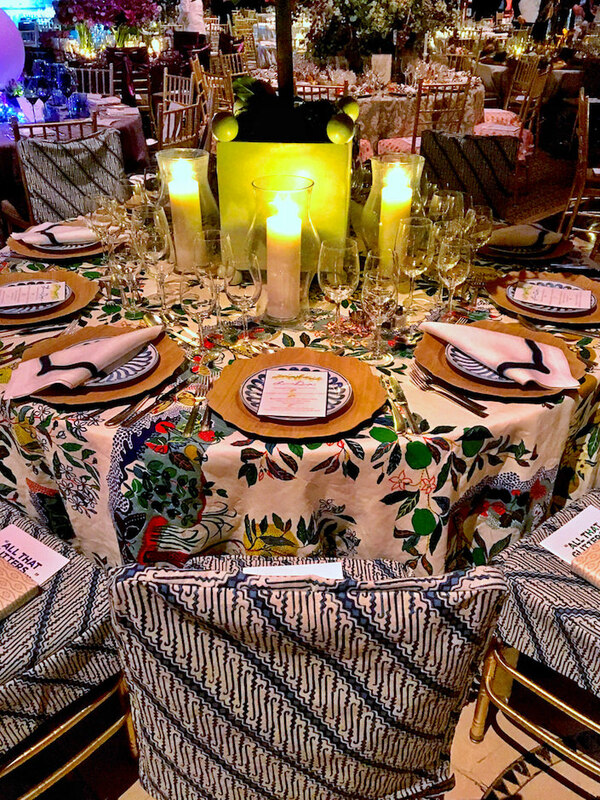 Channeling the tropics, nature and sea life, they employed their new Exotica Collection of fabrics and wallpaper designs for the table linen, chair covers and dinner napkins. 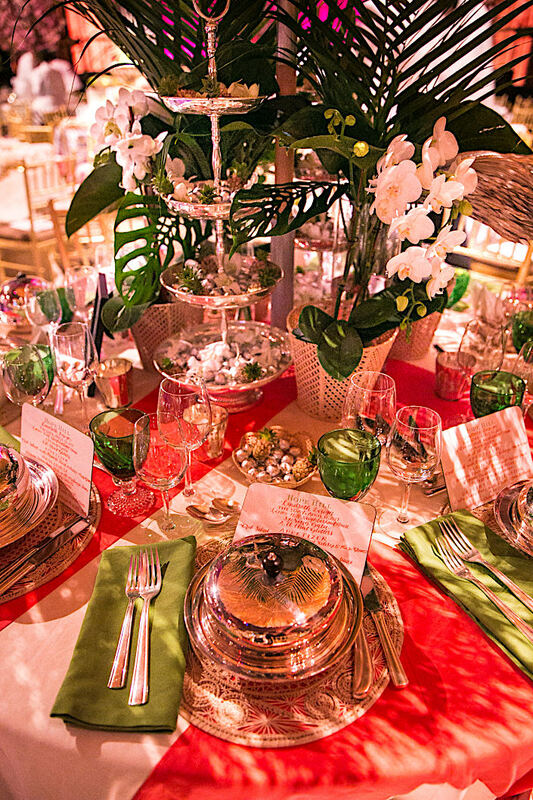 Lenox’s Casual Radiance plates and Serena & Lily baskets completed the tropical scene. 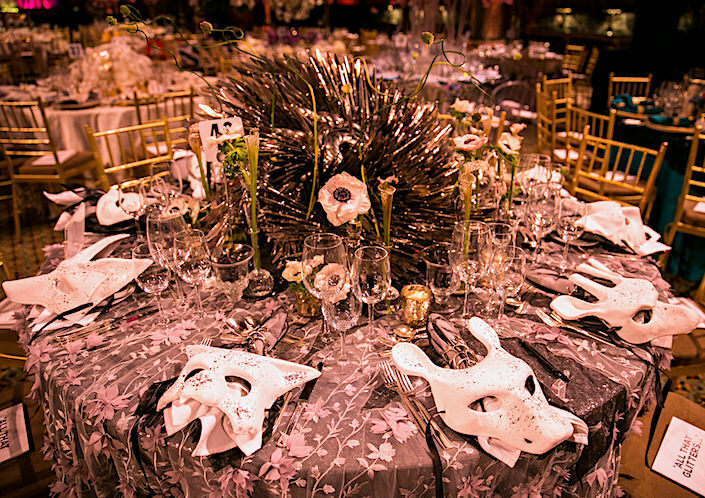 Designer Grace W. Kaynor created a table Birds of a Feather Glitter Together for Sotre, her eclectic New Orleans shop. 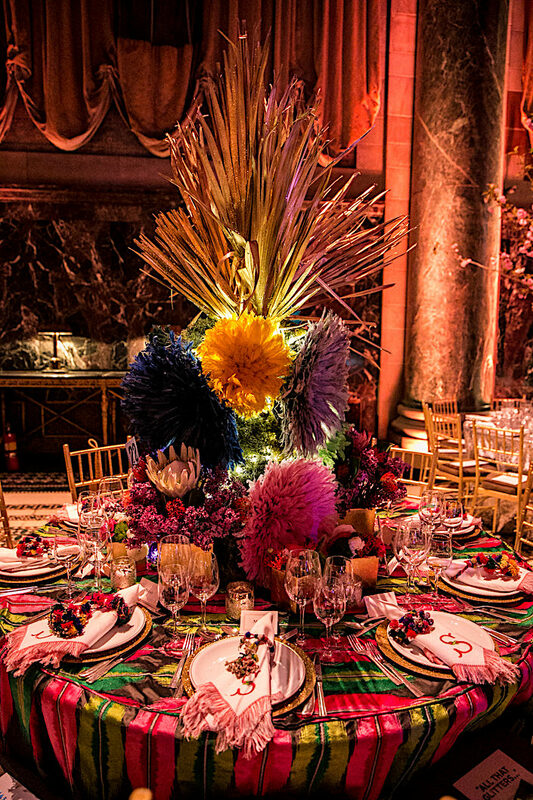 With a vibrant Manuel Canovas tablecloth, she added texture and variety with Kronbali Juju hats. Jared Hughes and Nina Nash designed a table of Subversive Composition for Mathews Furniture + Design. 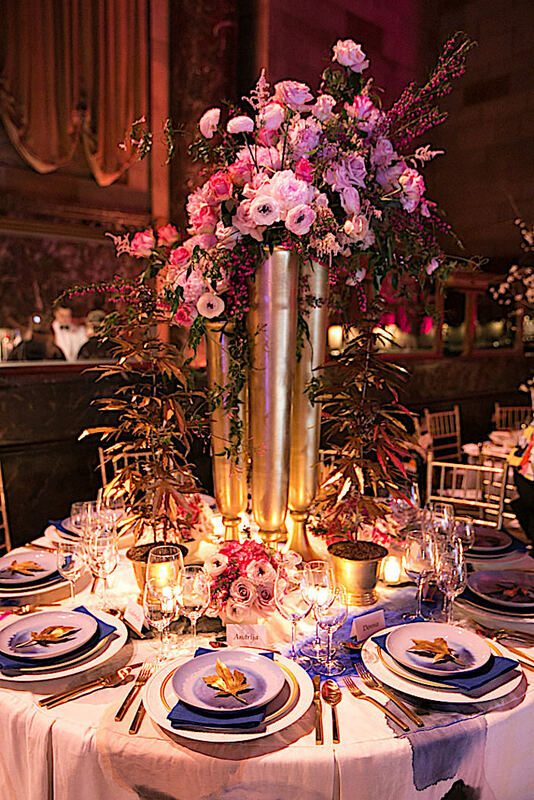 On a tablecloth handpainted by Kristen Giorgi of NG Collective Studio, dinnerware by l’Objet sat beneath a towering profusion of pink peonies. 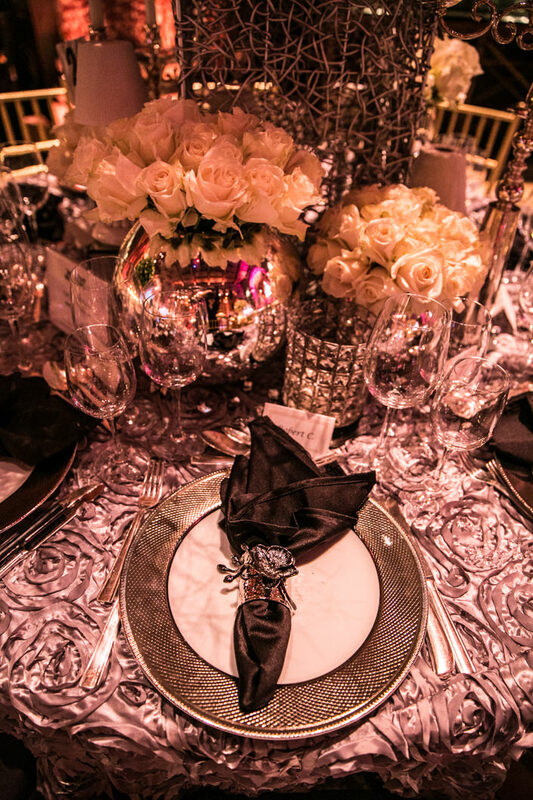 Christofle chargers and Michael Aram accoutrements accentuated the silvery scene. 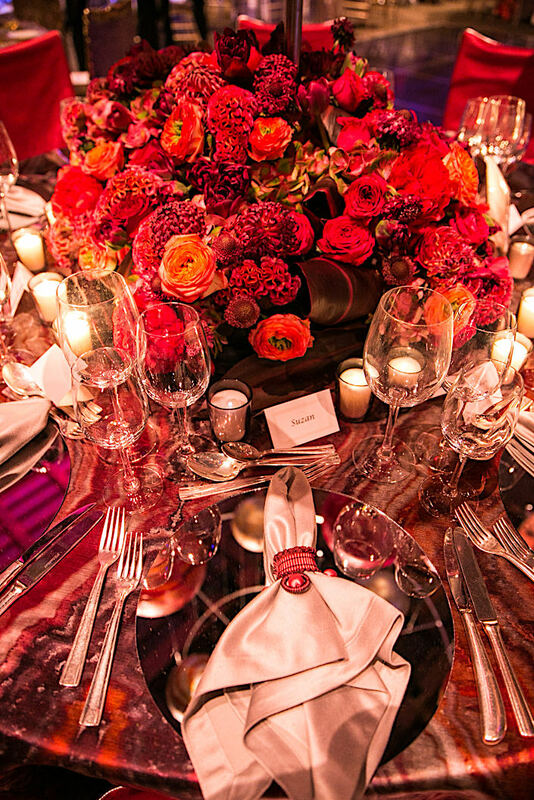 Roric Tobin for Bradfield & Tobin displayed an exuberance of rich red roses with dramatic uplighting. 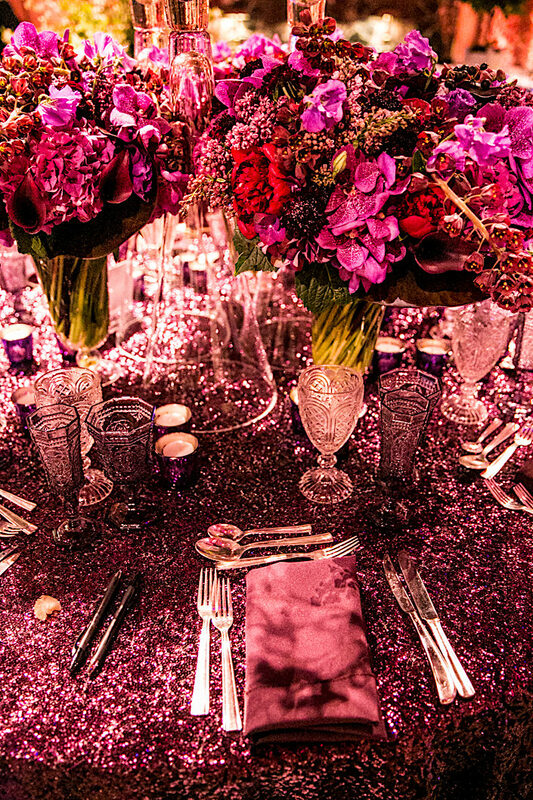 Frank Alexander‘s Extravaganza was a table of glittering gold. 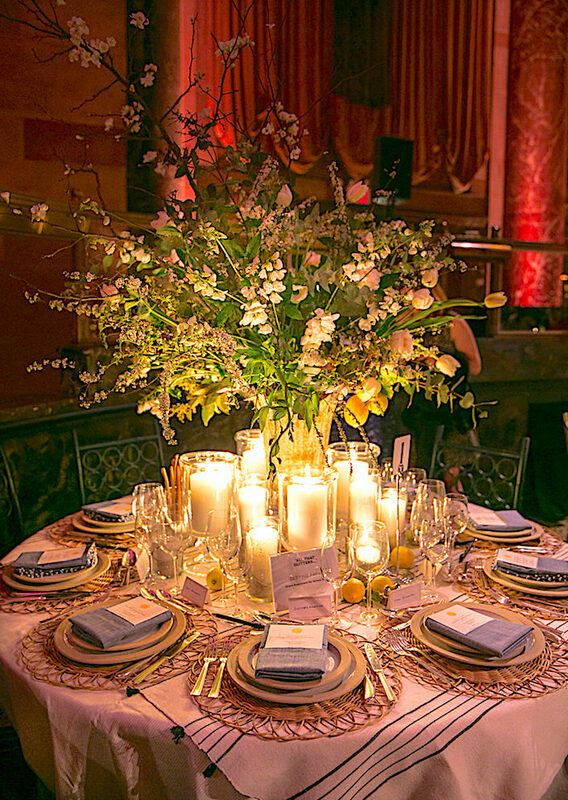 Congratulations to all the designers at the Lenox Hill Neighborhood House Gala 2017, including any perhaps not featured in my rush to cover as many tables as was possible. Stay tuned next for the debut of an exciting new video series! This entry posted in design, interior design. 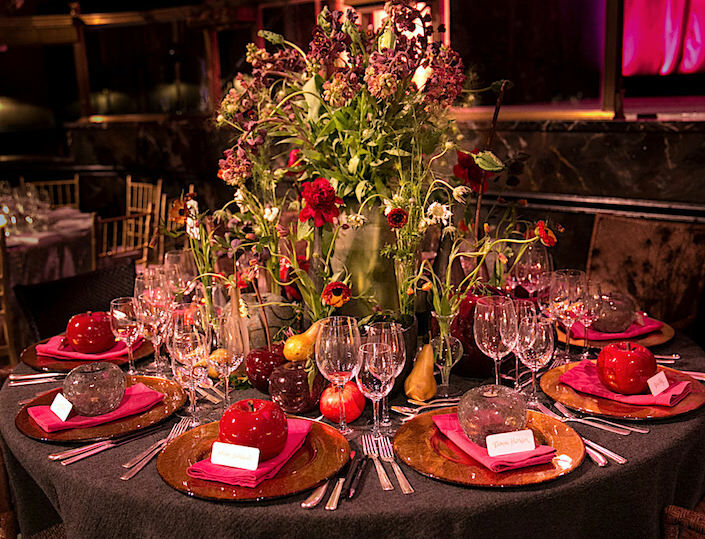 Entry Tags: Entertaining, interior design, Lenox Hill Neighborhood House, Lenox Hill Neighborhood House Gala, Tabletop, Tabletop events Bookmark the permalink. 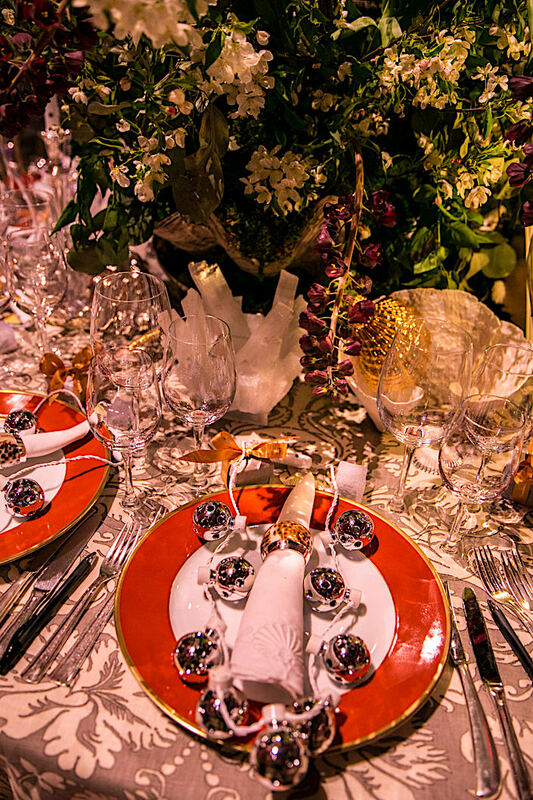 Thank you so much -loved seeing all these gorgeous festive tables! I am once again amazed by the detail in these works works of art!! Beautiful! A feast for the eyes. Just when I think “THIS” is the best…there is yet another…absolutely fantablelous!! franki p.s. I have the gold paper doilies!!! 80 queries in 0.614 seconds.